Puzznic is following Sokoban's success! Eliminate all game objects from the screen! Whenever two or more similar objects are adjacent, they are "evaporating". But beware, often the situation is so tricky, that the game objects just do not want to come together or you end up with just a single element of a certain type left. Usually it just cannot be done without a solution strategy! 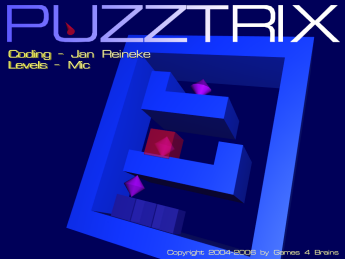 Puzztrix is a game for brains, after all. What qualifies PUZZTRIX as a Sokoban follow up? Puzznics simple game rules: Easy to learn but hard to master! Easy to handle: All important options can be reached with a single mouse click. Additionally, there are keyboard shortcuts in case you are using a notebook and do not have access to a mouse or you just prefer the keyboard. Solutions to each level are saved as Movies. Later on, you can watch your solution like you would watch a small movie. Every step can be taken back using the Undo function. The game speed can be increased and decreased. Switch back and forth between windowed mode and fullscreen mode. Freely choose which level to play. You do not have to solve them one after another anymore. Still, the program records, which levels you have already solved. Whenever you improve one of the given solutions (movies) your new solution is recorded.